Green means "Go!" for men and women in Holland. Photo via spacing.ca. Not only is it important on gender grounds—those little walking people are just one more place where ungendered turns out to be male—but it’s fun! D.C. could desperately use more frivolity. 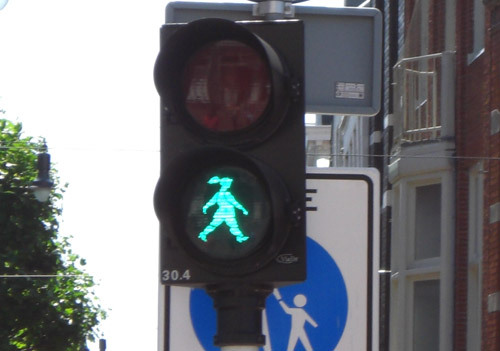 If there were a way to avoid cost concerns, it would be great to have a whole variety of figures—male and female, young and old, etc.—walking and not walking. Perhaps there is some local art collective willing to make a donation?